I’m a huge fan of bacon, it seriously makes everything taste that much better. Even chocolate! Bacon can be used for breakfast, appetizers, dinner and yes even dessert! 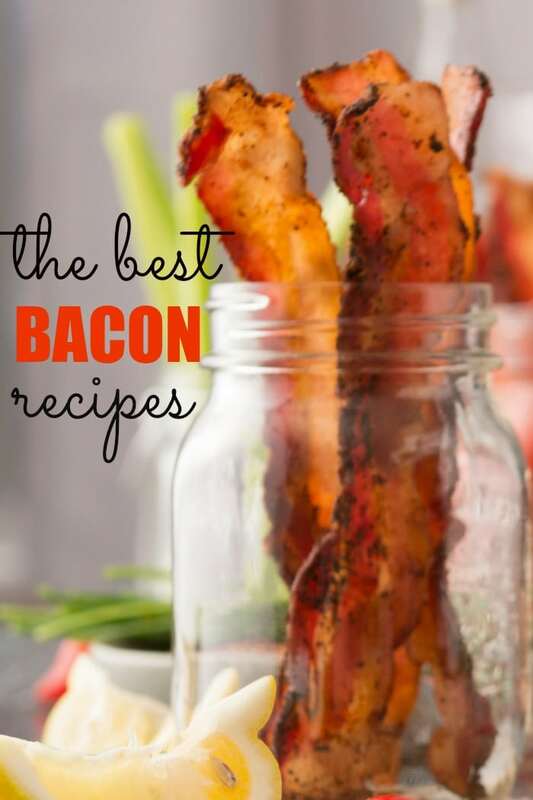 This page showcases some of my best bacon recipes. I hope you enjoy these recipes as much as my family does. When cooking bacon there are a few things you should keep in mind. First off try to get the best cut of bacon possible. I will usually purchase my bacon from the butcher counter in the grocery store. The cheap thin stuff just doesn’t have the same flavor. If you don’t enjoy cooking bacon in a skillet you can easily cook some up in the oven. Set your oven to 400 degrees, line a baking sheet with foil, place your bacon on the foil-lined baking sheet and cook for about 15 minutes. I will usually check my bacon around the 12-minute mark just to make sure it’s not burning. Most of the time, you can start to smell the bacon right when it’s ready. Make sure to let the bacon rest on some paper towels to soak up any oil. Get creative with bacon as it goes with just about everything! Chicken Bacon Skillet – Chicken and bacon is the perfect combination. This dish is loaded with flavor! It’s sure to be a family favorite. Bacon S’mores – Such a fun twist on a traditional S’more not to mention the kids thought it was the best dessert ever! Chocolate Bacon Pretzels – I can’t get enough of these. They are so yummy and easy to make. These are a must try. Bacon Wrapped Jalapenos – What can I say these are amazing! I use gruyere cheese but you can use any type of cheese you’d like. Make sure to check back more bacon recipes will be coming soon! If you have a favorite bacon recipe you want me to try, make sure to let me know. I’m always happy to try out a new bacon recipe.